Mains powered electric fence energisers. Mains fence energisers normally need also a 2m long earth stake and lead out cable to complete the electric fence system. The new intelligiser range from Rutland electric fencing features larger energisers that have an automatic boost mode which mantains the fence voltage underload and adds a new safety features. With built in diagnostics the electric fence energiser circuitary is protected from extreme damage. 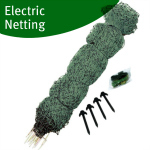 These electric fence energisers continually monitor the fence line load. When sudden change in load is detected the energiser will wait before it increases the output power. This is a safety feature which should allow any person or animal trapped in the fence to extract themselves. Horizont and AKO offer lower priced entry level electric fence energisers for smaller fence systems. It is always best when choosing an energiser to look at a slightly larger one than you currently need in case you wish to expand your fencing. 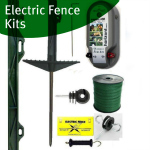 Where possible mains electric fence energisers are advisable as they give you a permanent and reliable power option to your electric fence. They range in output and the amount of fencing they can power so it is important to choose a fence energiser that capable of powering what need and also a bit more to give you scope. AKO N700 Mains Fence Energiser: Compact mains fencer unit for small paddocks. This is an entry level energiser that can power 1.5km of fencing with average vegetation. AKO N1000 Cavallo Mains Fence Energiser: Moderate power mains fence energiser for short to medium sized fences that can power up to 2km with normal vegetation. Horizont M2 Mains Fence Energiser: Entry level mains fence energiser for short to medium fences that can power 4km of electric fence with average vegetation. Horizont M4 Mains Fence Energiser: Moderate power mains fence unit for short to medium fences that can power up to 6km of fence with average vegetation. Horizont M7 Mains Fence Energiser: Very strong mains fence energiser for medium to longer fences, stronger shock with a distance rating of 7km with average vegetation. Horizont Hobbygard N Mains Fence Energiser: Domestic fencer for fencing domestic animals suchs as dogs, cats and protecting gardens and yards with a 1.5km distance rating. 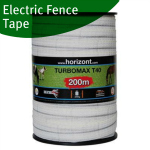 Horizont N15 Farmer Mains Fence Energiser: Strong mains energiser for medium length fences, strong shock with a distance rating of 3.5km with average vegetation. Horizont N25 Farmer Mains Fence Energiser: Very Strong energiser for medium to longer length fences, strong shock and is capable of powering 15km of fence. 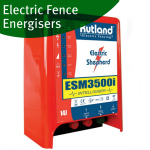 Rutland ESM401 Mains Fence Energiser: Entry level fencer for shorter fences with 0.3 Joules stored energy it can power 1.5km of fencing with average vegetation. Rutland ESM402 Mains Fence Energiser: Moderate sized mains fencer for short to medium lengths of fencing, it has 1.6 Joules stored energy with an average rating of 2.5km. Rutland ESM602 Mains Fence Energiser: Strong mains energiser for medium lengths of fencing with stored energy of 2.5 Joules it can power 3.5km of fencing with moderate vegetation. Rutland ESM902 Mains Fence Energiser: Very strong mains energiser for medium to longer length of fencing with stored energy of 5.4 Joules it can power 11km of fencing with average vegetation. Rutland ESM2500 Mains Fence Energiser: Powerful mains energiser for longer fences with stored energy of 7.5 Joules giving a strong shock and fence rating of 7km with moderate vegetation. Rutland ESM3500i Intelligiser Mains Fence Energiser: Very powerful mains energiser for large amount of electric fencing with 14 Joules giving a strong shock and a distance rating of 15km with average vegetation. Rutland ESM4500i Intelligiser Mains Fence Energiser: Very powerful mains energiser for longer fences with 18.5 Joules of stored energy it will gives animals a very strong shock and it has a distance rating of 20km with moderate vegetation. Rutland ESM5500i Intelligiser Mains Fence Energiser: Extremely powerful mains energiser which is the largest in the Rutland Electric Fencing range. For large systems of electric fencing it has stored energy of 26 Joules and an average vegetation rating of 26km but can power up to 100km of fencing. 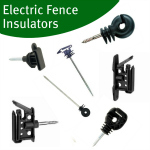 If you need any advice on electric fence energisers please let us know.